This semi-flush mount from the BOKU collection is sure to bring style to any room in your home. The oil rubbed bronze finish and glass diffuser adds softness to your dicor. This is perfect for the kitchen, bedroom and hallways. Add sophistication to your kitchen with this Fairview 2-Light Heritage Bronze Chandelier. Included metal mounting hardware has attractive heritage-bronze finish for elegance. Bulbs are covered using beautiful water-patterned glass shade for an interesting light diffusion. UL-listed. 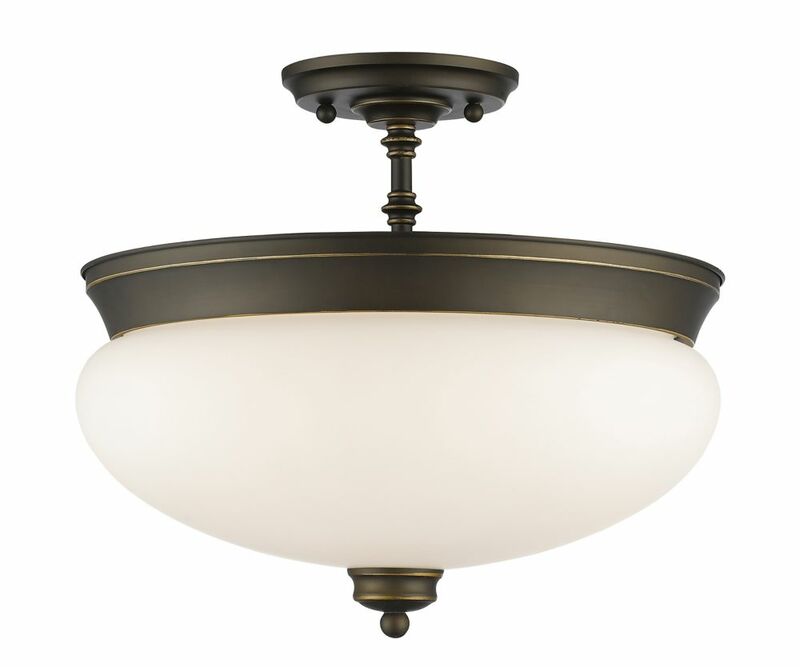 The cornerstone of the Providence Collection is quality, and this flush mount is no exception. Combining a classic olde bronze finish and posh styling, you will find no better way to highlight the charm of your home. With the superb craftsmanship and affordable price this fixture is sure to tastefully indulge your extravagant side. 3-Light Olde Bronze Semi Flush Mount with Matte Opal Glass - 15 inch This semi flush mount will update your home with its eye-catching design. Featuring an olde bronze finish and matte opal shade(s), this fixture will accommodate a variety of dicor styles. With its easy installation and low upkeep requirements, this semi flush mount will not disappoint.